Most of the general public were made aware of Full Facial Transplantation through the 1997 movie, Face/Off, starring John Travolta and Nicholas Cage. In the movie, the two actors play an FBI agent and a terrorist who exchange faces through hi-tech surgery. Fourteen years later, Full Facial Transplantation is already a viable option in the treatment of severe facial deformaties and injuries. Not exactly like in the movie where the two "swap" faces but the technology is close enough to recreate that scenario in the real world. 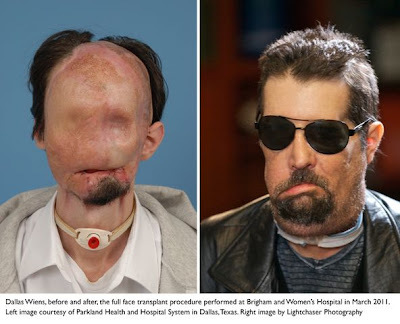 Boston, MA - In March 2011, a surgical team at Brigham and Women's Hospital (BWH) performed the first full face transplantation (FFT) in the United States and went on to complete a total of three FFTs this year. Now, in the first research publication to evaluate FFT in the US, and largest series worldwide, the researchers describe details of patient preparation, novel design and execution of the operation as well as unique immunosuppression protocol allowing for lowest long-term maintenance drug regimen. They also share details of the early functional outcomes and demonstrate FFT as a viable option in the treatment of severe facial deformities and injuries. This research is published in the New England Journal of Medicine in the December 27, 2011 issue. 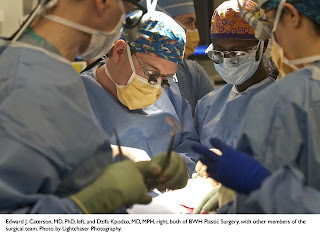 "Unlike conventional reconstruction, facial transplantation seeks to transform severely deformed features to a near-normal appearance and function that conventional reconstructive plastic surgical techniques cannot match," said lead author Dr. Bohdan Pomahac, Director of the Plastic Surgery Transplantation Program at BWH and lead surgeon in all three FFT procedures. "It truly is a life-giving procedure for these patients." "Our focus moving forward continues to be on monitoring and documenting the progress of patients who have undergone FFT, and refining the use of immunosuppressants, with the hope that one day patients will eventually need to take little or none," said Pomahac. We are also learning how brain reintegrates the new parts, and follow closely motor and sensory return. Important part of the study is also calculation of cost-effectiveness. The study was funded by a research contract between the United States Department of Defense and Brigham and Women's Hospital under the Biomedical Translational Initiative Program.